Well hello again! It has been a while and I apologize for the extended break but what I love most about blogging is that you can come back at anytime! Well I decided to start the new year off….well…new! So to do that I feel inclined to start with taking this year in a new direction! I have been busy crafting in all kinds of different forms and after a long self-imposed hiatus, have come back to also quilting again. To end 2011 off right I decided to reorganize and clean out/purge the Quilt Nook so as to get a better idea of what I was still into and what I could donate or get rid of. That was quite cathartic and it has been lovely to get back into the nook again! In doing this I discovered I have had a year or so of lots of starts but not so many finishes….I think to start 2012 off new I need to finish what is left behind. I have compiled a list of this things to follow so as to give myself a place to see my progress. As you can imagine there are soooo many new things I would like to do as well, but find making project goals while there are still so many WIP’s very counterproductive. SO here are some of the things I would like to get finished so as to free up my goal list, besides, who doesn’t love the feeling of finishing! 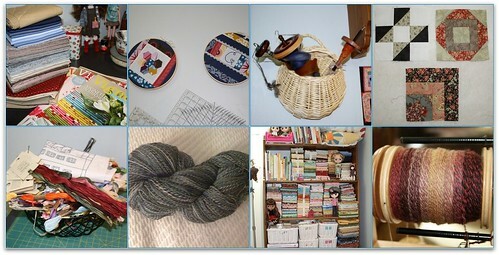 I also would like to catch up my photos, ravelry data and flickr photos. I have a Hoop up Swap to write about and pics to upload for stash and finished projects as well. Hmmm seems I have my work cut out for me~I suppose I should get to work then and tackle my large list! I feel if I can move some of these to the finished pile, I will be much more inclined to move forward with a clean slate! Hope you all had a wonderful New Years celebration and I hope to see you here again!